“A budget is a moral document. As an elected official representing all of Nashville’s children, it matters to me that our budget reflects our morals. We must be good stewards of our schools’ resources, and we have an obligation to ensure that the funds entrusted to us are properly spent. Our budget discussions are not personal. They are about the policies that we enact as a board which will affect our community for the next decade or more, and it’s our job to ask the hard questions. This year’s budget has kept me up at night. Never before have I received so many concerns and questions about the budget, and not just about the changes to Title I funding. A wide variety of concerns about this budget and the district’s spending have been raised. In pouring over budget materials these last several weeks, I have found more questions than answers and have noted what appear to be a number of financial red flags. 1. Over the past two years, there has been a dramatic increase in unauthorized purchase requests in the district. An unauthorized purchase request, or UPR, is just what it appears to be: an unauthorized expenditure. Ideally, a UPR is never used because a purchase order should always proceed any purchase, and the only time a UPR should be used is in the case of an emergency, such as broken pipes. During this administration’s first year, the number of unauthorized purchases increased more than sevenfold – from approximately $300,000 to $2.3 million. The trend continues this year. I am aware that sometimes URPs are triggered by accidental errors, and in a school district as large as ours, there is a certainly a human error percentage to take into account. But the ballooning number of unauthorized expenditures is a very serious problem that warrants investigation. 2. The administration entered into a no bid contract- or some sort of agreement- with Research for Better Teaching, and has paid this company over $100,000 without the required board approval, which is in violation of our board policies. I’ve heard more than one explanation from the administration about the lack of board approval, but the fact of the matter is that this contract was placed on the consent agenda for approval and then pulled immediately when a board member began asking questions. Paying vendors before seeking board approval has been an ongoing problem for this administration. 3. There is an appearance of nepotism happening within our district in a way that benefits a few but that does not benefit our children. New employees with close ties to the new administration are being paid more money for less work, including unexplained stipends and salaries outside the salary schedule. For example, one Chief’s spouse is making a $24,000 stipend in addition to her salary, even though she has less job duties and less employees to supervise than others. Another Chief’s friend is making more than any other elementary school principal, including those with more credentials. MNPS is also paying half the cost for this principal to receive her doctorate. Furthermore, the first draft of this year’s budget proposal reflected much higher pay increases for those at the top of the pay scale than the 2% raise offered to teachers. This was changed when a board member noticed the problem and pushed back. 4. In the first year of this administration, consultant costs grew from $5.1 million to $8.6 million, and some of the new consultants appear to be problematic. For example, last August, the board approved a literacy contract with R.E.A.D. America, LLC, for $150,000. When I searched for information about this company, I was unable to find a website or any other information online. The company appears to be one-woman operation run out of someone’s home in Chicago, and MNPS seems to be the sole source of this person’s income. I also received complaints about another consultant, Bruce Taylor, and decided to look into his background. From Mr. Taylor’s marketing website, I learned that he has no background or training in education, but is instead an actor who now promotes Common Core. The district has paid Mr. Taylor over $100k without board approval, and according to a Channel News 5 story, Mr. Taylor worked in the district six months without a contract. I am also concerned because I recently learned that an outside organization has brought in the former superintendent of Knox County schools to work with MNPS. He is now attending all executive leadership meetings. According to Knoxville board members, this man ‘left a trail of disaster in his wake.’ Knoxville colleagues tell me their former superintendent spent too much and started too many unsustainable programs, leaving the school system in financial straits. Now that this superintendent is gone, Knox County Schools must cut key programs to make up for the deficit. 5. The administration is piggybacking substantial service contracts, some worth over a million dollars, from contracts in other counties. Piggybacking is a procurement tool that allows for no bid contracts. Piggybacking service contracts, as MNPS has done, is problematic because of the inherent risk of fraud and the potential to get less than the best price. One such no-bid service contract with Performance Matters was piggybacked from contracts in Shelby County, TN and Orange County, FL, for a total of $1.1 million. Yet, the Performance Matters contracts filed with the Metro Clerk’s office show that the contracts with Performance Matters are not to exceed $1.8 million. I want to know why the board was not consulted on this change. Performance Matters is affiliated with non-profit company called Education Research and Development Institute, ERDI. According to a News Channel 5 story last week, Dr. Felder has received consulting fees from ERDI. ERDI partners include a number of other companies to which the district has awarded large contracts, including Discovery Education, for $13 million, and Scholastic, which hosted 10 Metro employees, including Dr. Felder, at the Ritz-Carlton on Amelia Island in February 2017. According to a News Channel 4 story, MNPS helped pay for the Amelia Island conference, but Scholastic also comped rooms for MNPS employees at the five-star hotel, where rooms typically cost $700 per night. Contract discussions with Scholastic took place on Amelia Island, and immediately after the conference, administrators tried to place an extremely large contract with Scholastic on the board agenda. It was pulled when a board member questioned it. A couple of months later, in April 2017, the board approved a two-month contract for Scholastic to supply classroom libraries for $140,000. I would like to know how much Scholastic paid for the Amelia Island conference and for MNPS attendees specifically, including room fees, meals, drinks, or any other perks, as well as any consulting fees. We need an investigation into all consulting fees garnered by MNPS employees, particularly those related to companies affiliated with ERDI. I would also like to know which contracts with ERDI partner companies were no-bid contracts. So in sum, these are the problems as I see them: questionable contracts, consultants, and expenditures; overpaid employees; and at the very least, a disregard of proper procurement procedures. These problems have been amplified in light of the way the budget has been handled this season. With regard to contracts and consultants, the common theme seems to be avoidance of board scrutiny. That is the very opposite of transparency. Due to ‘budget constraints’ this year, the district has already cut paper, toner, and other basic supplies from schools, curtailed professional development trainings starting in February, removed funding for school plays, cut out year-end student celebrations, and in general defunded the efforts of those on the ground- the very people who touch children’s lives daily. And now this administration has proposed cutting seven social workers and our free and reduced lunch program next year. It would be possible to make up for much of the shortfall just by cutting salaries and raises at the top of the scale. For example, excluding benefits, vacation days, raises, consulting fees and other perks, our Director and his five Chiefs alone earn salaries totaling over around $1.2 million dollars. This would pay for 22 social workers. Of course, we must pay our leaders reasonable salaries, but in a budget crunch, it’s critical that we keep our priorities straight. All of this is disappointing and distressing because I have placed my full support behind this administration. I believe the board and administration have done excellent high-level work during the last two years, and it’s difficult to reconcile the work we’ve done with the issues I’ve raised. But it turns out that where the rubber meets the road, the focus is not really on students. While Williamson County has the lowest property tax rate in middle Tennessee and the lowest of any county with a population over 100,000, County Commissioners and the County Mayor are now pushing a sales tax increase scheme that will ultimately rest with local voters. 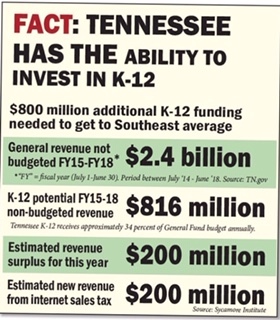 All of this comes about because the Williamson County Commission continues to exhibit a preference for low taxes and lattes over investment in schools. Pushing for an increase in the county’s sales tax to help fund future school projects was a cornerstone of Williamson County Mayor Rogers Anderson’s 15th annual State of the County Address. The final passage of the proposed 25-cent sales tax increase would be left up to residents in a county-wide referendum, but Anderson has been visiting the county’s six municipalities over the past several weeks in efforts to convince cities to agree to an inter-local agreement that would allocate a portion of new revenue to cover debt service for schools. “The school system could see an additional $60 million by the arrangements we’re working on for three years,” Anderson said. All of that sounds great — until you realize this is the most regressive way to raise revenue. Oh, and it has to be approved by voters. I saw this scenario play out in Sumner County in 2012. County Commissioners faced pressure to raise revenue for a school system growing rapidly. The Commission could not pass a property tax increase. Instead, they put a wheel tax increase on the ballot — twice. It failed both times. After the wheel tax increase failed twice, County Commissioners ran around saying voters didn’t want a tax increase at all, not even a property tax increase. So, the school budget would have to be cut. Here’s how this movie ended: Voters turned out in record numbers in 2014 in Sumner County to elect new County Commissioners. The new commissioners promised to explore every option to raise revenue for a county that hadn’t seen a property tax increase in 12 years. A property tax increase was passed that allowed Sumner County to invest in schools and other needs while still maintaining the second-lowest property tax rate in middle Tennessee. The school system now has a budget that is funded by the revenue generated from a growing county with a low tax rate. Williamson County is in an even more enviable position than Sumner. Williamson has the lowest tax rate in middle Tennessee — by 35 cents. 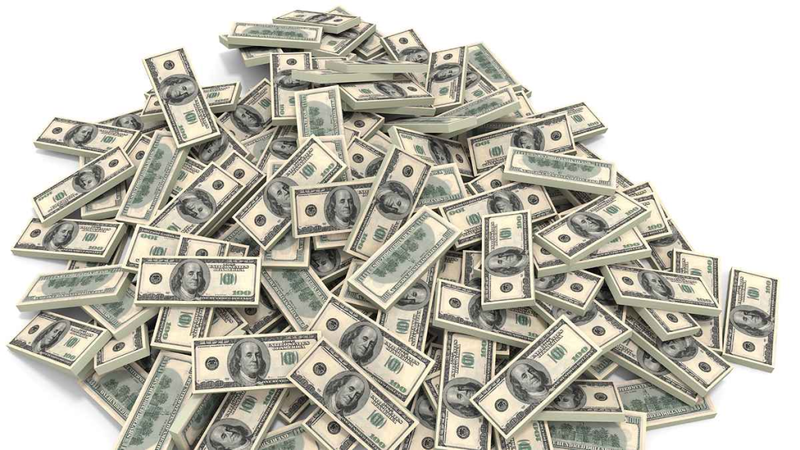 Each one penny increase in the property tax generates $1 million in revenue. A 10-cent property tax increase would generate $10 million — more than enough to fund this year’s budget request — and would still give Williamson the lowest tax rate in the region by 25 cents. What Mayor Anderson is pitching now may sound like good news. It’s not a long-term solution, though. Even if it somehow passed, the sales tax increase and inter-local agreement scheme is just kicking the can down the road. Here’s the alternative (best) option: Raise property taxes a modest amount — maintain your system’s reputation for excellent schools AND enjoy the lowest property tax rate in the Nashville region.